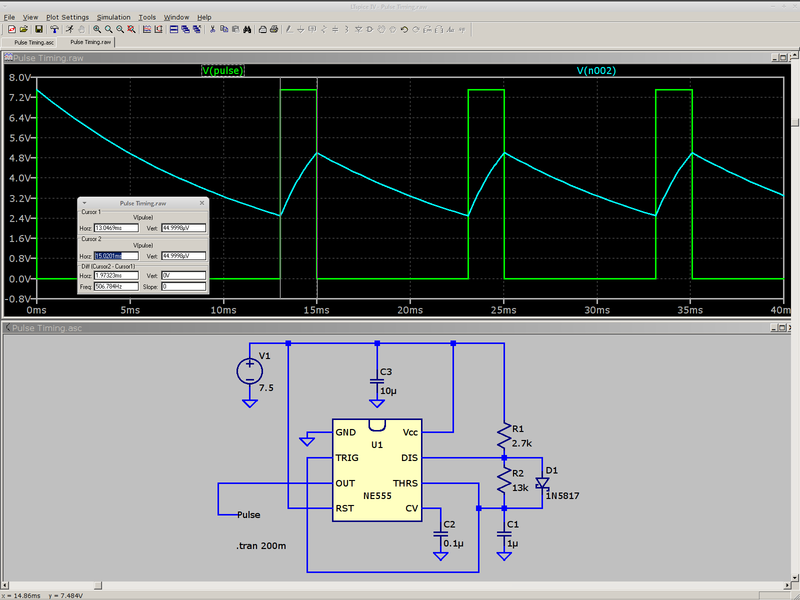 I want to stress-test some LEDs for the long-stalled bike taillight project with a high current / low duty cycle drive. The usual specs give something like 100 mA at 10% duty cycle in a 100 μs period, but maybe they’ll withstand more abuse than that; I don’t have any specs whatsoever for these LEDs. The usual DC rating is 20 mA, so 100 mA at 20%, say 2 ms in a 10 ms period, should give the same average power as the DC spec. I plan to run them continuously until some failures to pop up or it’s obvious they’re doing just fine. Although this would be a dandy Arduino project, a classic 555 timer IC makes more sense for something that must run continuously without changing anything. The usual 555 circuit restricts the duty cycle to more than 50% for high-active pulses, a bit over the 20% this task calls for. The simplest workaround is a Schottky diode across the discharge resistor to separate the two current paths: charge uses the upper resistor, discharge the lower, with the diode forward drop thrown in to complicate the calculations. In round numbers, a 1 μF timing capacitor, 2.7 kΩ charge resistor, and 13 kΩ discharge resistor do the trick. Given the usual capacitor tolerances, each resistor should include a twiddlepot of about half the nominal value: 1 kΩ and 5 kΩ, respectively. I’m thinking of repurposing those Wouxun KG-UV3D batteries for this task and found a 7.5 V 3.5 A wall wart in the heap that will be close enough for the test rig. The 555 output should drive a logic-level MOSFET just fine, although even an ordinary FET would probably be OK for the relatively low current required for LED toasting. This entry was posted on 2012-12-24, 07:16 and is filed under Amateur Radio, Electronics Workbench, Software. You can follow any responses to this entry through RSS 2.0. Both comments and pings are currently closed. Interestingly, I just grabbed a 555 for my latest project. I needed an audio output that changed with frequency (not a precision voltage-to-frequency conversion, just audible feedback). Originally, I used the venerable LM331, which is designed for the purpose, for breadboarding. Worked a treat. But the final version needs to be tiny, and the LM331 isn’t available in a surface mount package. I ended up using a 555 instead, which is a little trickier and less linear, but is easy to find in all sorts of tiny packages (the 5-lead SOT-23 is adorable and would look nice next to the LV321 op-amp, but doesn’t have the needed pins). The 555 will never die; in the day when we figure out how to build starships, they’ll have 555 timers doing something indispensable, probably right next to all the dust-mote x86 CPUs running embedded doodads. Curbside Classic refers to some cars being the “cockroach of the road”, in that they’ll never be gone. I guess the 555 counts as such in IC-dom. What advantage do you get running the LEDs at a higher current and lower duty cycle? Reducing the power loss in a current-limiting resistor / linear charge-control system, or something else? The main advantage happens in dimming, where the apparent brightness varies very linearly with the duty cycle. It doesn’t vary quite so directly with current, which is why linear dimming doesn’t work quite so well. PWM also simplifies the drive circuitry, because the LED is either on or off. A cheap MOSFET switch and a resistor, plus a stable power supply, may be all I need for wide-range dimming: no fancy current sensors needed. In real life you would use a dedicated current-mirror driver, but the same principles apply. … and then forgot the main gimmick: dotted lines! This will eventually become a bike taillight, where conspicuity counts for almost everything. The 100 Hz blink rate provides excellent flicker fusion in a stationary eyeball, but turns the LEDs into dotted lines during eye movement due to either normal saccades or just scanning the scenery. Alex ran across this online circuit simulator: http://www.partsim.com/ – thought you might be interested. Now that’s a nice application! But I still think many of the failures we see arise directly from believing that the simulation represents reality, that you’ve correctly modeled all the factors, and the real world won’t present any surprises. The more complex and detailed the simulation, the better the results… and the more spectacular the failures!